For those who believe in God no explanation is necessary. For those who do not believe in God, no explanation will suffice! A Lady from heaven gives a piece of paper to a girl in Medjugorje, (Mirjana). The paper contains secrets of future events. When the scientific community heard about the paper they asked to study it. Having studied it, linguistic experts from around the world say there is no known language. The paper is also carbon tested to determine age and substance. Scientists are unable to determine the age of the paper. They concluded that the parchment is made of an unknown substance. One sign that is always spoken about when discussing Medjugorje is about pilgrims’ rosaries turning gold. A multitude of people have claimed this miracle has happened to them. Many people believe it is a gift from God and Our Lady and that there are many different reasons for receiving this gift. 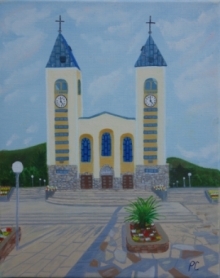 It could be to strengthen their faith, to thank them for coming to Medjugorje, or a sign that their prayers have been answered, as well as many other reasons.